Denisa Kera (CZ) & Daniël Erasmus (RSA/NL) will perform a public reading of Tarot Cards to discuss a 21st century science & technology controversy. 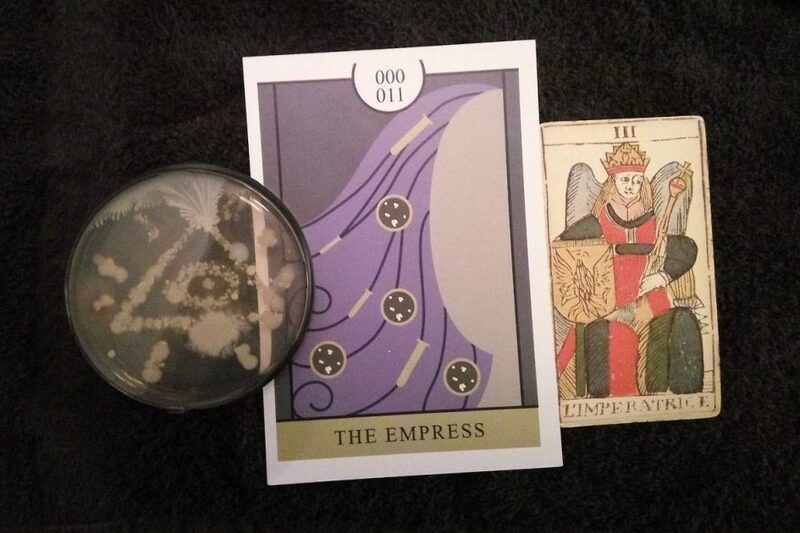 The reading creatively connects our past with the future, science and technology with poetic imagery, and identifies actions and attitudes towards future scenario’s. In this public reading and performance, Denisa Kera & Daniël Erasmus combine old divination techniques with present business strategies, to test the limits and possibilities of collective brainstorming and public imagination. This performance can be seen as a form of civic and civil dialogue on our future, with a goal to identify our collective hopes and fears, whilst we also come up with ideas of what we can do to achieve a future, which is desirable. “The “Parlor of futures” is both a tarot card parlor and hacklab, which performs the genealogy of different ideas and practices related to reading and making futures. In this lab-parlor, which can be set up anywhere in the world, we exhibit, create and use our specially designed and prototyped “cards,” which feature lab on a chip and IoT technologies. We combine the “futures techniques” and scenarios, with old divination techniques and iconography from Tarot cards, Voynich manuscript and alchemy, to prototype the future with DIY electronics, aesthetic circuits, new materials and paper microfluidics. Denisa Kera is a philosopher and a designer with interest in open science and citizen science issues. She is part of the Hackteria.org network, a community of scientists and designers working on open hardware for science projects. Currently she’s Visiting Assistant Professor at Arizona State University. Daniel Erasmus is a futurist and scenario thinker who founded the Digital Thinking Network (dtn.net) where he has lead global scenario planning processes for global clients in the public and private sector as well as central banks.